When you are shopping for Vancouver sofa beds, you need look no further than Expand Furniture. We offer a line of high-quality sleeper sofas in stylish and comfortable designs. You can find everything from twin sofa beds to king sofa beds, ensuring you get just the size you need to accommodate your space and ensure that your guests always have a great night’s sleep. The exceptional service you get from Expand Furniture and the high quality of our products is what sets us apart. Ask for referrals or read our online reviews and you’ll keep getting the same positive feedback about our superior service and top-rated line of sleeper sofas. Variety is critical to helping you find the right sofa bed for your home. Many retailers limit your choices by offering just one size of sleeper sofa or one stale design. Expand Furniture offers sleeper sofas in a variety of sizes and designs, ensuring that your sofa is both practical and stylish. You can create the décor you want while also maximizing your space. The Harmony line is the most popular among our sofa beds. It includes single sofa beds, queen sofa beds, and king sofa beds. You can even mix and match the line so that you create a complete seating area in your living room and have enough sleeping space to accommodate a whole family. Another thing that makes the Harmony line of sofa sleepers a great choice is that they offer customization. You can choose from a few different options for fabric colors, and you can further accessorize your sofa bed with pillows, linens, or some of the accent furniture that we sell, such as side tables and modular shelving units. Our goal is to give you the flexibility to find the exact options you need for a sleeper sofa, whether you are shopping for your living room or your toddler’s room. Expand Furniture strives to offer you the best sofa beds by using only the best materials in the construction of our furniture, as well as by ensuring only the highest quality of workmanship. Our sofa beds are made to last, and it shows. Sturdy wood, such as eucalyptus, and steel are used to construct the frames for the sofa beds so that they do not become rickety or creaky. These beds support over 1,000 pounds of weight without suffering loss of functionality or comfort. Durable yet comfortable fabrics are used to cover the couch and the cushions, ensuring that the sofa does not become pocked with stains or holes over time. You don’t have to worry about stiff or scratchy fabrics on these sofa beds – the soft, smooth surfaces will make you feel like you are settling into a soft pillow. 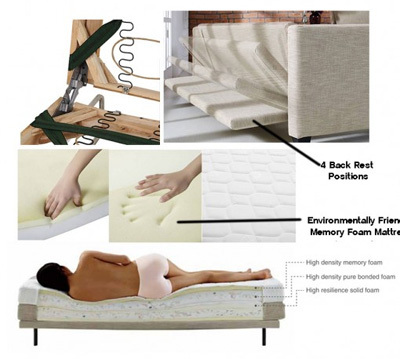 Finally, we use only top-quality memory foam for the mattresses on our sleeper sofas. This foam maintains its support over the years, continuing to give you the best night’s sleep possible. The foam contours to your body, providing support where you need it and comfort everywhere else. Guests will love sleeping on your couch bed – they may even love it more than sleeping on their own beds at home. Whether you are shopping for a sleeper sofa to provide additional space for guests when they call or you want a dual-purpose piece of furniture to help you make more use of the space you have for yourself, Expand Furniture has the solutions you need. Our stylish sleeper sofas will look great in any room of your home, and they will offer a better night’s sleep than you’ve ever had on any other couch bed. Get the perfect sleeper sofa for your home! Don’t waste time with retailers that hype up the quality of their sleeper sofas but don’t deliver on their promises. 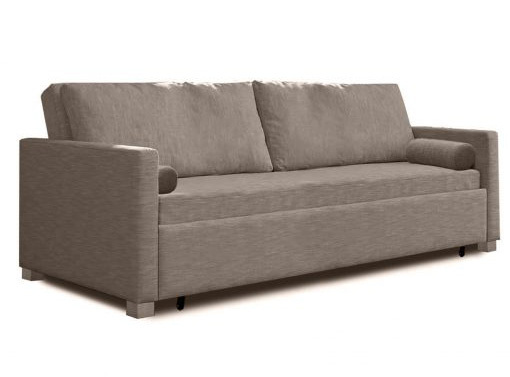 Expand Furniture has an established reputation throughout Vancouver for our exceptional sleeper sofas and our high quality of service. Hundreds of online reviews from actual customers back up our claims. Browse our online catalog now to find the perfect sleeper sofa for your home. Contact one of our friendly customer service representatives if you need any help narrowing down the selection or if you have any questions about our line. Showroom viewings in Vancouver are available during weekdays between 9am-5pm. We recommend making an appointment in case we are out at the warehouse or assisting other customers! Weekend or Evening appointments can be arranged.